The whole weight of the tester is 50% less than the traditional dead weights type tester. Test load selection by keyboard and LCD screen. Fully automatic test cycles. The Brinell hardness Tester features a fully automatic test cycle, load application, holding, unloading, is performed fully automatically. This greatly improves reproducibility of test results since operator influence is eliminated. Selectable dwell times by screen. The indenter, load, and other test information are shown clearly on the large LCD screen. The directions for 0.102F/D2 ratios selecting according to the materials and hardness range can be showing on the screen. Equipped with a 20X optical microscope to measure the diameter of Brinell indention. Brinell Hardness Calculator (BHC) make the hardness value calculation easier and convenient. NIST/ASTM certified hardness test blocks, penetrators and kits are available. With the advent of new requirements for quality control, accurate and reliable hardness testers are needed today more than ever. The King Brinell is designed to make impressions that are used to measure the hardness of a metal. A universally recognized tester, the King portable Brinell has a number of advantages. Permanence – Impression can be checked and rechecked at any time. Accuracy – Calibrated accurate to 1/2 of 1% of load. 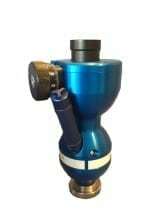 Can be used for higher loads up to 3,000 kg. Breaks through surface heat treatment to get to the core of the material. Durability – Some King Portable Brinell testers have been working for over 60 years. On the market for over 60 years, King Brinell hardness testers are lightweight, easy to maneuver and require only one operator, making them ideal for use as portable or bench units. Versatile enough to test virtually any size and shape of metal specimen, King testers are easy to use. 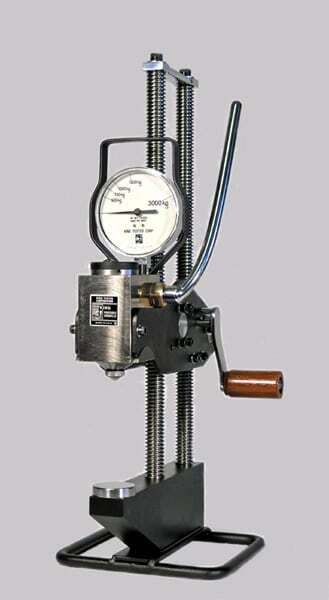 The operator simply places the specimen between the anvil and the test head, cranks the test head down onto the specimen, locking the tester in place, closes the pressure release valve, and pulls the hydraulic lever until the desired load is reached. The tester applies up to a 3,000 kg load on a 10mm ball, making a lasting impression, which is available for re-reading at any time. A by-pass valve is automatically activated at the calibrated load, eliminating the chance of overloading. The impression is then read and recorded by the operator using a Brinell microscope such as the King deep reading microscope or a Kingscan automatic Brinell microscope. The King Portable Brinell meets all international standards for Brinell testing including ASTM E-110, British Standard #240, Pt. 2, Sect. 1 and JIS Standards, and is calibrated to 1/2 of 1% of load on equipment traceable to NIST Standards. Innovative closed-loop technology. The tester incorporates the latest load cell technology. The test load is applied via a closed-loop control unit with a load cell, a DC motor and an electronic measurement and control unit. 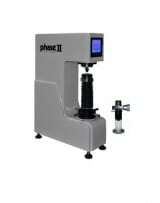 The result is highly accurate Brinell hardness measurements at all test loads up to 0.5%. The common load overshoot or undershoot as known from traditional dead weight, or open-loop, systems is eliminated. The absence of mechanical weights not only eliminates friction problems but also makes the equipment less sensitive to misalignments caused by vibrations. The gross weight of the tester is 50% less than the traditional dead weights type testers. Test load selection by keypad and shown on the LCD screen. Fully automatic test cycles. The Brinell hardness Tester features a fully automatic test cycle, load application, dwell, unloading, is performed fully automatically. This greatly improves reproducibility of test results since operator influence is eliminated. Brinell Hardness Calculator (BHC) makes the hardness value calculation easy and convenient. 1.3M pixel CMOS USB camera with two camera tubes with each tube height having two magnifications. Auto-alarm: Automatically marks the out of spec measurements; Test report: Automatically generates customizable WORD or EXCEL report.